Two of Finland's finest young jazz virtuosos in concert on their Asia/Australia tour. In a short period of time, Olavi Louhivuori (22) has achieved a strong place in the jazz scene in Finland both through composing and playing, being one of the busiest and most working jazz drummers in Finland. Olavi is studying at prestigeous Sibelius Academy of Music in Helsinki and has already made tours in Europe, Asia and Australia. 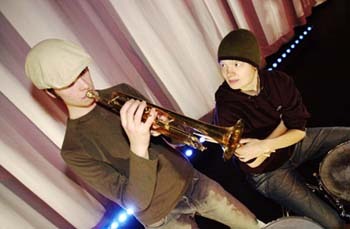 Joined by his brother Kalevi Louhivuori (21) on trumpet they make a dynamic jazz duo performing both standards and original material. Kalevi also studies at the Sibelius Academy in Helsinki, and despite his young age, he has performed with a number of internationally recognized musicians such as Bob Minzer, Indgrid Jensen, Dave Liebman, Charles Tolliver, and Jukka Perko.